"Contains material originally published in magazine form as Guardians of the Galaxy #13-19." "The silent king Black Bolt and the tyrant Vulcan square off in interstellar combat--with the Guardians stuck in the middle trying to restore the peace! 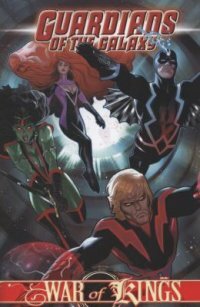 With the Inhumans and Shi'ar laying waste to entire planets, somebody has to stand up for the little guy--even if those somebodies include a walking tree, a talking dog and a rocket-firing raccoon!"--P. of cover. New York : Marvel, c2009. Description: 1 v. (unpaged) : chiefly col. ill. ; 26 cm.